The renovation and expansion of Elano's conference room included finish upgrades and technological improvements. The new design accommodates twenty people in an environment with inconspicuous technological and presentation elements. Design limitations were set by existing parameters that consisted of narrow corridors of fixed limited size and fixed existing room proportions. 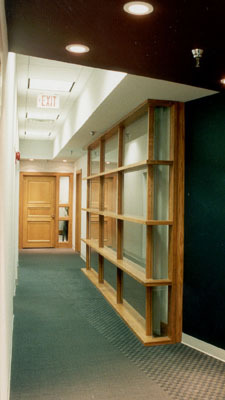 The solution to rotate the conference room to create expanded space was visually supported by the extension of its finishes into the corridor. Copyright © The Architectural Group, Inc. All Rights Reserved.